Seared scallops served with crisp pancetta slices and a vinaigrette of lentils, carrot, leeks, tomato, thyme, garlic and balsamic vinegar. Pan-fried scallops served with a risotto of shiitake, oyster and button mushrooms finished with fresh parmesan shavings. 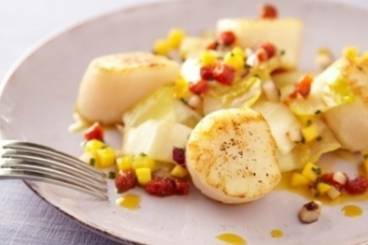 Pan-fried scallop skewers served with fennel cooked in an orange and honey glaze.